In the video, Obama appears to insult President Donald Trump and make fun of Secretary of Housing and Urban Development Ben Carson, before it is revealed that the president's image is a digital modification. DALLAS, Texas (CAN) -- Like any figure of importance, there is high likelihood that the Pope or another Catholic leader could be the subject of a fake video using a rapidly improving technology -- and everyone needs to take care not to empower such a hoax, said Rudolph Bush, director of journalism at the University of Dallas. "It's very likely to happen, I think, and the consequences could be serious," Bush told CAN April 23. "Depending on who is targeted by this, depending on how ripe that target is to be manipulated, it could be very damaging." For Bush, the prospect is "really worrisome," given reports that social media have been used to incite societies during elections or times of racial or ethnic tensions. These tensions are manipulated to foment "not only political strife but war and in some cases genocide." Bush has worked as a professional journalist since 1997, serving as Dallas and Enterprise editor at the Dallas Morning News. He has written for the Chicago Tribune and the Dallas Morning News on politics and crime. He spoke in response to the development of so-called "deepfake" videos, which are created with artificial intelligence software. One video published by Buzzfeed appeared to feature former U.S. President Barack Obama in a public service announcement about fake news. "We're entering an era in which our enemies can make it look like anyone is saying anything at any point in time -- even if they would never say those things," Obama's image said. "So, for instance, they could have me say things like, I don't know, 'Killmonger was right!'" said the digitally modified president, referring to the antagonist in the 2018 hit movie "Black Panther" who aimed to launch a global African uprising. In the video, Obama appears to insult President Donald Trump and make fun of Secretary of Housing and Urban Development Ben Carson, before it is revealed that the president's image is a digital modification. 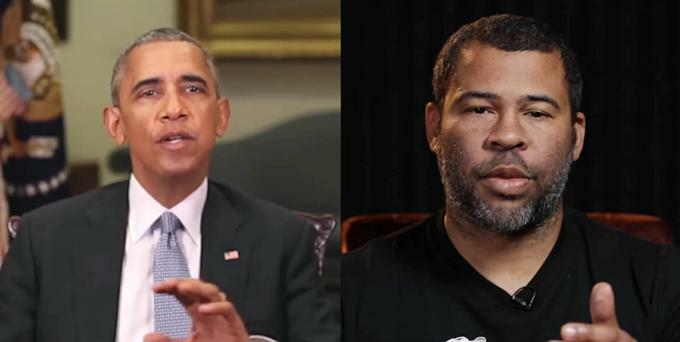 His lips have been synchronized with those of filmmaker Jordan Peele, who has acted as an Obama impersonator. "This is a dangerous time. Moving forward, we need to be more vigilant with what we trust from the internet," Peele's Obama says. The footage of President Obama was manipulated and set to a script. Adobe After Effects and a program called FakeApp were used. Rendering of the clip took about 56 hours. Peele, a filmmaker who won an Oscar for the movie "Get Out," conceived the video with his brother-in-law BuzzFeed CEO Jonah Peretti. With the prospect of such videos, Bush said, one has to work to "straighten out what is fake news and what is real news." "What it does is sow seeds of distrust and worry in societies," he said. "And of course democracies are based on communal trust, the idea we can get together and solve our problems peacefully." The rise of the "deepfake" video also poses the question: will falsehood triumph? "There used to be an old saying that the truth will win out. That is something that we based our societies on, our journalism on: over time, what is true will carry more weight than what is false," Bush continued. "That's being tested now." "We live in an age when there is so much false information, at such a volume, that it can be hard to sort out what is true," he said. "We have a responsibility as consumers to verify what is true, and when we understand what is true, to share it with our fellow parishioners." He advised readers to find trusted sources of information within their community, whether in their church community or in the local newspaper, and to rely on those. "This is a really difficult conversation in our society: whether people will trust the so-called traditional media or mainstream media," Bush said. "A great deal of effort has been put into sowing distrust in those organizations." "Know from where your news comes. That's very important." Both the fundamentals of Catholic teaching and of journalism and communication have shared priorities: "we seek truth, and we also verify truth," said Bush. "That has to be a priority when we go and we communicate. It's a responsibility to communicate truthfully, to make sure the information we're disseminating is truthful, it's verified, that it's critically appraised, before we start disseminating it," he said. "Otherwise we just become part of the problem." For Bush, it is hard to say whether the new video technology will fundamentally change the media environment or simply continue current trends. People have become more savvy about relatively new technological hoaxes, such as scam emails promising money from a Nigerian prince, he noted. "Nobody believes that kind of stuff anymore. So we do adapt," Bush said. "At the same time, as these things become more sophisticated, particularly if they're used by state actors or groups with a high level of understanding of what it takes to manipulate a society or a group, then we'll see whether we can parse what's real or not real."